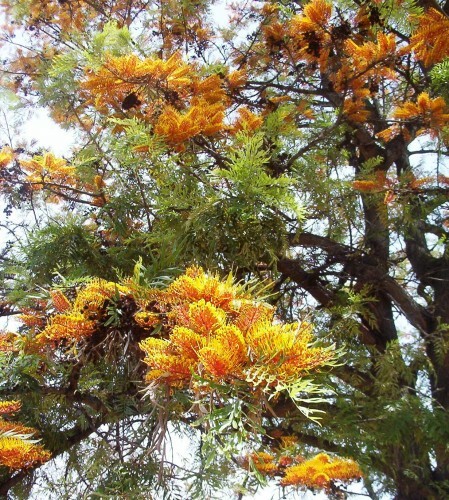 I had the opportunity to travel to Ethiopia, and what should greet me on leaving the airport but a stand of Grevillea robusta (Silky Oak), Acacia mearnsii (Black Wattle), a Melaleuca I didn’t recognize and a Eucalyptus species. (Who would have thought I would need Ivan Holliday’s book on Melaleucas in an overseas country?) Having seen these, my eyes picked them out constantly during our stay. There were forests of Eucalypts, attempts to keep Eucalypts going as street trees, and I noticed in some local nurseries, advanced plants of Eucalypts, Acacia and Grevillea robusta. In the grounds of the place where we stayed were Callistemon (Bottlebrush) species which looked like forms of Callistemon viminalis. It was a difficult exercise to determine what plants were the naturally occurring species in the country side of Ethiopia. There had been much clearing of vegetation, and because the naturally occurring plants were much slower growing, they were not replaced. The need for wood for fuel and building supplies compromised the revegetation programmes. Over the years many Australian species have been propagated in foreign nurseries and proved to be popular garden and pot plants for gardeners interested in the foliage and many unusual flower forms. I found this lovely, very hardy tree in a park. Grevillea robusta looks like a bonfire from the distance when in full flower. The trees can be very tall in areas of high rainfall. Here in South Australia, they become a good sized shade tree for back yards where the canopy can be used as an out door living area. I had a pile of cutting material, mainly some pieces of Grevillea which I dealt with today. It is a bit cold now, but nothing ventured, nothing gained. I managed half a tray full of nice looking cuttings and went out to see what material was on Grevillea ‘Winpara Gem’ to fill up the space. I walked past a small plant that I have had for years but had not had the heart to dig out. It has always been in the wrong spot so was mown, slashed and whipper snipped many times. It has 4 stems now. 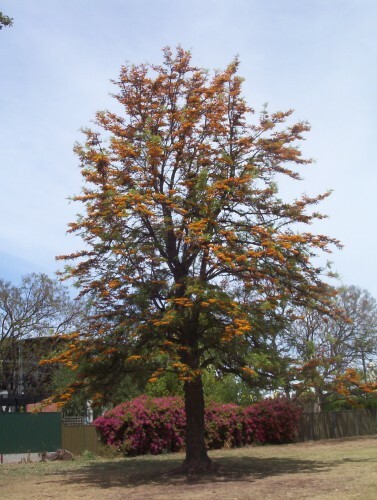 I realized a few weeks ago that it was a Kurrajong after I had read the article that prompted the post on Kurrajong. The amazing thing about this plant is that it has always been a good dark green, and does not get water artificially and has survived many heavy frosts over the years. I have decided, belatedly, that it deserves some TLC so that I can get some more height in the plant. It will be a shrub shape rather than a tree now. I doubt that cutting 3 of the 4 branches out will help as it seems to induce more branching from the base of the plant. Anyway, to fill up the tray I cut one of the branches that was growing across the plant. I was able to take 6 nice pieces of tip growth as cuttings to see what will happen. I will put in some seed later also. This plant is no longer in the wrong spot! I was thinking about the Grevillea species in the last post. The local form of Grevillea lavandulacea, called ‘Monarto’ is an open small shrub with deep reddish pink spider clusters. I noticed in ‘The Grevillea Book’ Olde and Marriott, that this probably should be called ‘Mt Compass’. Whatever the correct name, it is a very pretty shrub. A form that I’ve had for years is from the Barossa Valley I think. It has almost ruby flowers in large clusters. The honeyeaters love it when it is in flower. When I told friends last night over dinner about the deer, they reminded me of the ferral deer in the South East of SA and that there are ferral deer in the Jamestown district (mid north of SA). I did not know of them. The ones in the South East are a hazard on the road. There are more deer than kangaroos to deal with, especially at night. We were always concerned when our daughter, who was teaching in the South East, had to travel one particular road to Penola, at night. She also discovered that echidnas don’t do car tyres much good, either! The above Grevillea do very well in high pH soils like ours which has limestone rubble in it. Once established they will cope with the winter wet, summer dry climate and 350mm (about 13inches)Â of rain. They need to be trimmed after flowering to maintain bushiness. I was looking at blogs to do with gardening last night and came across a site called the Golden Gecko written in California (the name attracted me). That’s not too amazing in itself. What hit me in the face were the photos of Grevillea ‘Molongolo’ and Grevillea lavandulacea ‘Penola’. These were being recommended as suitable plants for the impoverished soils in the area. And they would be good for that purpose. They also do well here (country South Australia). 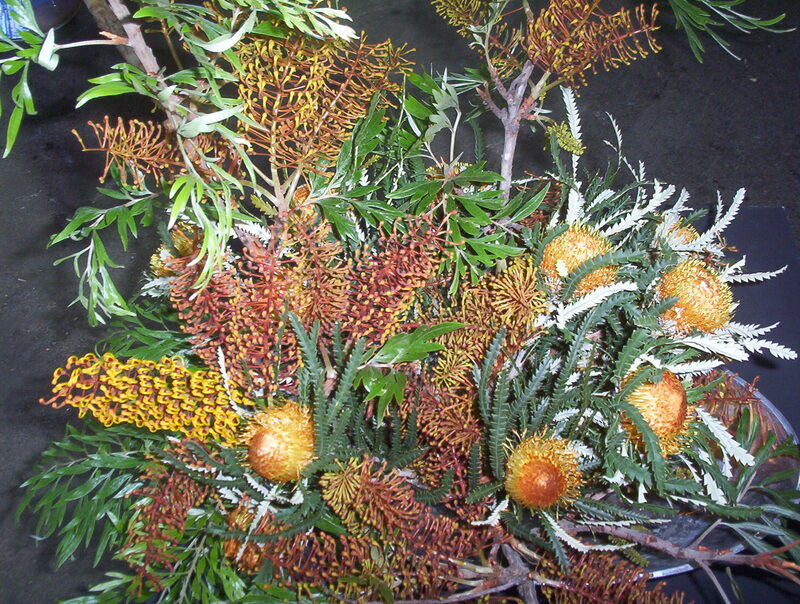 “Molongolo” is a registered cultivar, a hybrid between a dwarf, yellow form of Grevillea juniperina from New South Wales and an upright, red-flowered form of G juniperina from near Canberra, ACT. It can grow up to 5m across in ideal conditions (I’d like to see that here! ), with apricot coloured flowers. It needs to be tip pruned from an early age to encourage the denseness of a good ground covering plant. It also responds well to pruning. As with most plants, pruning is best done after flowering but this plant has a long flowering period. In general I would say that when there are signs of new growth is a safe time to prune most evergreen plants. As a rule don’t prune back to bare wood, but look for small branches or shoots to cut back to (unless you know for sure that the plant will shoot from bare wood). Grevillea lavandulacea ‘Penola’ has been in cultivation for many years. It has greyish foliage with a massed display of red and cream flowers which look wonderful against the grey foliage. 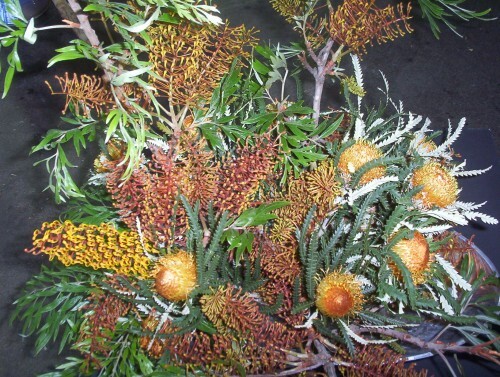 Apparently there is a question about whether it is actually a true form of G lavandulacea as it is very close to Grevillea ‘Poorinda Illumina’. We’ll let the botanists fight about that! The town of Penola is in the south east of South Australia. You are currently browsing the archives for the Grevillea category.